There is a lack of consensus on the importance of various drivers of long-run commodity prices. This column analyses a new dataset of prices and production for 15 commodities, including metals, agricultural goods, and soft commodities, between 1870 and 2015. Demand shocks due to rapid industrialisation and urbanisation have driven a substantial amount of variation in commodity price booms. While demand shocks have gained importance over time, commodity supply shocks have become less relevant. Understanding the drivers of commodity price booms and busts is of first-order importance for the global economy. A significant portion of real income and welfare in both commodity-consuming and commodity-producing nations hinges upon these prices (Bernanke 2006). They vitally affect the distribution of income within particular nations as the ownership of natural resources varies widely, potentially setting the stage for civil conflict (Dube and Vargas 2013). And the long-run drivers of commodity prices have serious implications for the formation and persistence of growth-detracting and growth-enhancing institutions (van der Ploeg 2011). But for all this, outside spectators – whether they are academics, the general public, the investment community, or policymakers – remain divided in assigning the importance of various forces in the determination of commodity price booms and busts. Understanding which shocks drive these events and how long they persist is important for the conduct of macroeconomic policy, formulating environmental and resource policies, and, perhaps most importantly, investment decisions in the resource sectors of the global economy. While the literature on modelling oil markets has examined a handful of booms and busts since the early 1970s (e.g. Kilian 2009, Kilian and Murphy 2014), our analysis of commodity markets is based on a new dataset of real prices and output for 15 grains, metals, and soft commodities from 1870 to 2015 (Jacks and Stuermer 2018). Unanticipated changes in world demand affect all commodity prices simultaneously. Throughout history, aggregate commodity demand shocks due to rapid industrialisation and urbanisation have driven commodity price booms. China’s recent effect on commodity markets is, thus, not a new phenomenon. 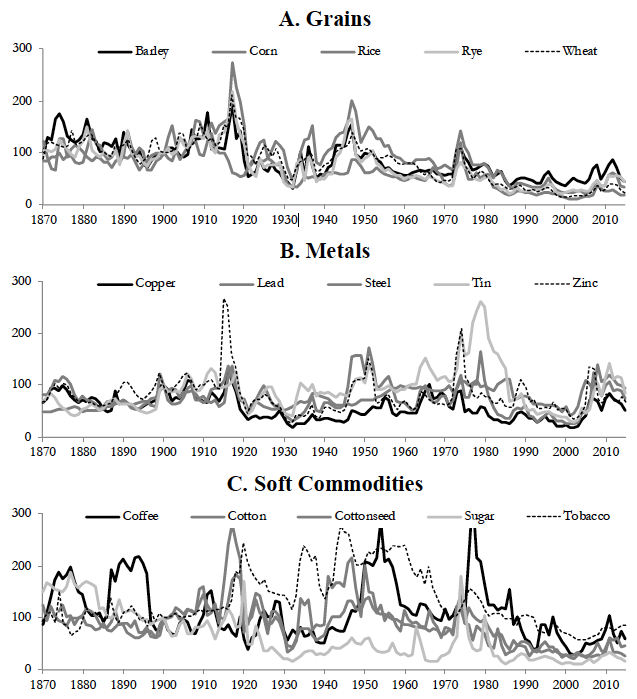 A new dataset encompassing global output and real prices for 15 commodities - barley, coffee, copper, corn, cotton, cottonseed, lead, rice, rye, steel, sugar, tin, tobacco, wheat, and zinc – has been assembled covering the past 145 years (see Figure 1) and representing in excess of $2.5 trillion in annual gross value of production in 2015. The commodity markets selected exhibit characteristics that make such long-run analysis feasible: a high degree of product homogeneity, long-standing evidence of an integrated world market, and no indication of sudden changes in how the commodity is used. Thus, they have desirable characteristics that commodities such as crude oil or iron ore have only gained relatively recently. Notes: The figures depict annual real price indices from 1870 to 2015 (100 = 1900). Source: Jacks and Stuermer (2018). At the most basic level, commodity price booms and busts are driven by unanticipated supply and demand shocks. For example, a commodity supply shock could be an unexpected decline in production due to cartel action, natural disasters, or strikes, which shift the supply curve inwards and increases prices in the short run. In contrast, an aggregate commodity demand shock could affect the demand for many different commodities at the same time. China’s rapid industrialisation and urbanisation, for example, led to stronger than expected increases in the demand for a broad variety of commodities such as copper, cotton, and rice over the past two decades. When building our econometric model to understand activity in global commodity markets, we assume that a positive aggregate commodity demand shock triggers investment in new productive capacity and productivity-enhancing technological innovation, allowing the initial shock to exert long-run effects on global output. In contrast, we assume that a commodity supply shock only affects global output for a few years. Any shock that is not attributable to either of the above is labelled a commodity-specific demand shock. This type of shock is assumed to only affect capacity utilisation and has no long-run effects on commodity production or global output. Our econometric model allows us to pin down the contribution of each type of shock to variation in real commodity prices over time. Figure 2 represents a counterfactual simulation of what the price trajectories of specific commodities would have been solely in the presence of accumulated aggregate commodity demand shocks. The collective story that emerges suggests that although aggregate commodity demand shocks affect prices to different degrees, they affect the real commodity prices at roughly the same time. This then suggest that aggregate commodity demand shocks likely have a common source. What is more, this interpretation is in line with what economic history has to say about variation in global output. Our historical decompositions start in 1875, when prices were depressed due to the negative accumulated effects of aggregate commodity demand shocks on prices during the first – but somewhat forgotten – Great Depression. The effects of subsequent aggregate commodity demand shocks are in line with our historical knowledge about business cycles in major economies. For example, in the early 1930s, real prices plummeted, as the (second) Great Depression reduced global demand for commodities. After WWII, positive aggregate commodity demand shocks led to increases in real commodity prices as reindustrialisation and reurbanisation in much of Europe and Japan proceeded, followed by the economic transformation of the East Asian Tigers. Negative aggregate commodity demand shocks are evident in the late 1970s, the early 1980s, and the late 1990s, respectively corresponding to the global recessions of 1974 and 1981, and the Asian financial crisis of 1997. These are followed by a series of positive aggregate commodity demand shocks emerging from the late 1990s and early 2000s due to unexpectedly strong global growth, driven by the industrialisation and urbanisation of China. Finally, the lingering effects of the global financial crisis are also clearly visible in the series. Our econometric model further allows us to decompose variation in real commodity prices by commodity category and by period. 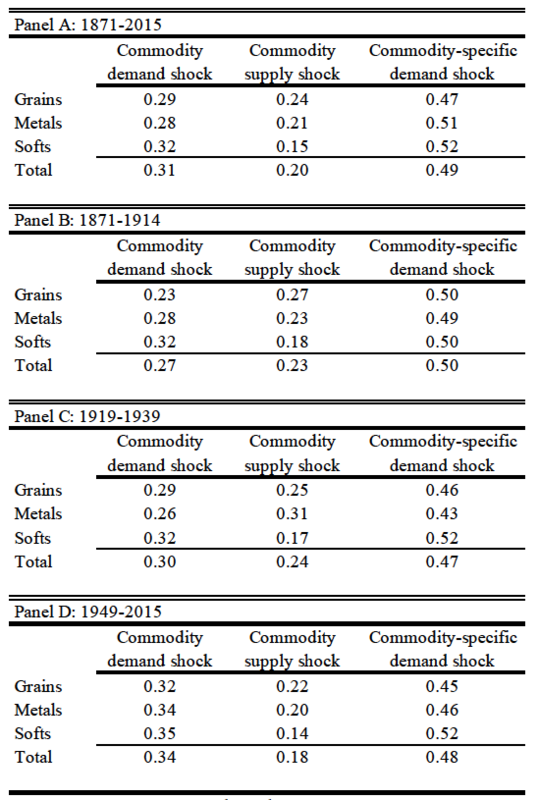 From 1871 to 2015, aggregate commodity demand shocks explain 31% of the variation in real commodity prices while commodity market-specific demand shocks explain 49% (Table 1, Panel A). Thus, these two types of shocks cause an appreciable portion (80%) of the long-run variation in real commodity prices. Conversely, commodity supply shocks play a rather secondary and transient role, explaining only 20% of the variation. Averages for three sub-periods based on the full sample (see Table 1, Panels B to D) show that supply shocks have lost importance over time, as their average share declined from 24% during the interwar period to 18% in the period after WWII. At the same time, the average share of aggregate commodity demand shocks increased from 27% in the pre-WWI period to 30% during the interwar period and to 34% in the post-WWII period. 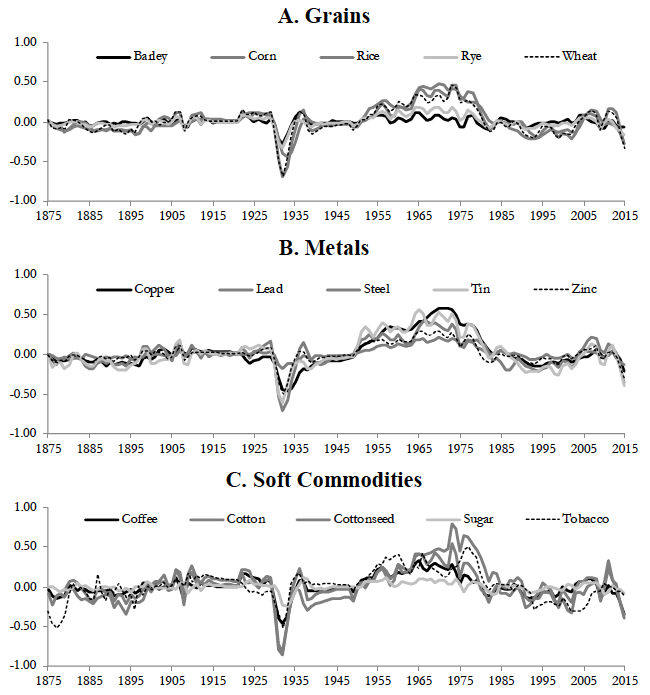 After examining the drivers of real commodity prices in the long run across different types of commodities, aggregate commodity and commodity-specific demand shocks appear to strongly dominate commodity supply shocks in driving variation in real commodity prices. These results suggest that the price effects of the large commodity demand shock attributable to China from the late 1990s to the early 2010s have fully dissipated. And in the absence of any other unanticipated positive commodity demand shocks, it appears that current prices will stay lower for longer, particularly in the present environment of a potential deceleration in global growth. Commodity exporters would, thus, be wise to buckle up and prepare for a prolonged period of low real commodity prices. Bernanke, B (2006) “Energy and the economy,” remarks at the Economic Club of Chicago. Dube, O and J F Vargas (2013), “Commodity price shocks and civil conflict: Evidence from Colombia,” Review of Economic Studies 80(4): 1384–1421. Jacks, D S and M Stuermer (2018), “What drives commodity booms and busts?” Hong Kong Institute for Monetary Research, Working paper 23/2018. Kilian, L (2009), “Not all oil price shocks are alike: Disentangling demand and supply shocks in the crude oil market,” American Economic Review 99(3): 1053–69. Kilian, L and D P Murphy (2014), “The role of inventories and speculative trading in the global market for crude oil,” Journal of Applied Econometrics 29(3): 454–78. Van der Ploeg, F (2011), “Natural resources: Curse or blessing?” Journal of Economic Literature 49(2): 366–420.